Yesterday by invitation, I attended the first known joint press conference between the LDS Church and its cousin, the Community of Christ (formerly known as the Reorganized Church of Jesus Christ of Latter-day Saints Reorganized Church of Jesus Christ of Latter Day Saints, or RLDS.) 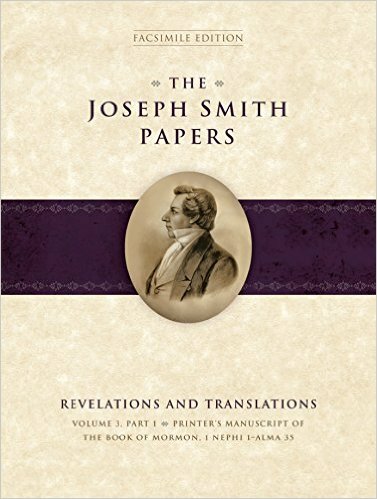 The occasion was the release of the 2-part 3rd volume in the Revelations and Translations series of the Joseph Smith Papers, the Printer’s Manuscript of the Book of the Mormon. As with the others, these books are hefty, high-quality, and thought-provoking. While available at Amazon (part 1, part 2), they will also be available in their entirety online soon. Since coverage of these new volumes and their import has been provided already by Steve Evans at ByCommonComsent, by Richard Bushman (various places), Ardis Parshall at Keepapitchinin, Juvenile Instructor, Deseret News and SL Tribune (where Joseph Spencer and one “Ben Speckman” are featured in the pics) and a preview of an article to appear in the Ensign in October 2015 with pictures of the seer stone, I thought I would offer a personal view. While on my mission in France, I learned about Joseph’s use of the seerstone, along with the Urim and Thummim/ Nephite “interpreters,” and eventually nothing at all, in translating the Book of Mormon. I suspect my source was something from FARMS (now the Maxwell Institute), since many of their books and papers referred to it. I had learned some intellectual humility early on in my mission and assumed I knew little, so I naturally took it in stride along with all the other new things I was learning. In 2004, midway through my graduate Semitics coursework, I taught a RM section of the Book of Mormon at BYU. On the first day, after going over the syllabus, I started in on background information about the coming forth and translation of the Book of Mormon, including the seerstone. After some minutes, one of the RMs (male, early 20s, like most of the class) asked with some hostility, “where are you getting this from?” He clearly thought I was making stuff up. I asked how many had heard of Joseph’s seer stone, and a few wavering hands went up out of twenty-odd students. This surprised me a bit. I’d unconsciously assumed that you went on a mission and read books, since that’s what I’d done. Thus caught somewhat unprepared, I asked a series of questions about historical sources, from imperfect memory. “Uh, well, how many of you have read any of the History of the Church?” No hands. “Richard Bushman’s Joseph Smith and the Beginnings of Mormonism?” No hands. “History of Joseph Smith by his mother? Or By The Hand of Mormon? ” No hands. “Ok, what about Elder Nelson’s article on the Book of Mormon translation in 1993 in the Ensign? That’s not too long ago.” Crickets. At this point, I was moving out of flustration into frustration. I don’t remember exactly what I said, but tried to keep it very measured and mostly failed. 2006, I’m teaching a freshman Book of Mormon class. This time, I prep a shotgun handout with some primary sources and secondary analysis. The freshmen respond well and take it in stride. I even integrate it into their midterm. a) The spirit and power of God. b) The Nephite “interpreters” (Mosiah 8:13). d) No physical instrument at all. g) A-C of the above. Today, roughly ten years later, we have the seerstone in full-color in The Ensign, going worldwide in dozens of languages. Now, the question is, where did it go, historically? Joseph’s seerstone was known to early members of the Church, and early histories, and now here it is again. The answer, I suspect, lies heavily with Joseph Fielding Smith. He served as Church Historian and Apostle for many years. As such, his views tended to carry weight. I’m unaware of how much he knew about the sources we have today, but he thought sources suggesting Joseph’s use of the seer stone were mistaken, and that Joseph made no such use of it. Church writings tended to reflect his views, and consequently, talked little about the seerstone for most of the 20th century (to my knowledge.) We’ve had a historical awakening, as well as 50 years of progress in terms of historiography, and his view is now thought to be quite wrong. Suffice to say, I think this shows that the Church wasn’t consciously hiding the seer stone, as much as accepting the historical authority of Fielding Smith. while art and artists are often credited with making historical, and particularly religious, ideas come alive and plainer to understand, an inherent problem enters when the language of religious art becomes translated into the language of history by its viewer. What we see becomes what we believe, and often, therefore, what we think we know about facts and details of history. And when we learn religious facts and history (from scholars or historians) that contradict what we think we know (through artistic renderings), a state of cognitive dissonance—and in the case of religious art, spiritual dissonance—can often be the result. The translation of the Book of Mormon is perhaps the most pertinent and pressing example of this problem today in the LDS mind. It’s a whole new ballgame than it was ten years ago with my RM class. The future is bright. Excellent post. I appreciate your insight and personal experiences with the evolution of the historical awakening. Thank you also for the links. I am very interested in all I can find/read on this topic. Very helpful insight about the possible influence of Joseph Fielding Smith’s (logical) but mistaken views. Excellent post as usual. This was similar to my experience although I am probably 20 years before you. In 1983, Steven Walker and (someone else, sorry) wrote about this in Dialogue and it totally made sense with other things I’d read. Naturally, I continued my education. As I’ve said elsewhere, the question this raises for me is one I’d left behind years ago (or so I thought) . . . WHAT THE HECK ELSE IS IN THAT VAULT? We all want to know what’s in that vault. Too bad it exists, but this is what happens for myth’s sake. My limited understanding is that the contents of the First Presidency vault have been moved to the Church History Library. That may be limited to documents, such as the George Q. Cannon diaries, the Francis M. Lyman diaries, the William Clayton journals, and the Council of Fifty Nauvoo records. But I’d expect they’d move everything. This makes sense simply from a preservation method: store your most valuable stuff in a new, state-of-the-art facility, or in a vault built in 1916? That is an interesting and logical conclusion by JSF. Joseph though the U&T was amazing, so why would he put them away to use a stone? (I’m going from memory here, so take with grain of salt until I locate my source(s). )According to Samuel Smith, the Urim and Thummim “in silver bows” were set too far apart for Joseph’s eyes. Either he could only look through one with one eye, or had it obscured with both. It was more comfortable to use the seer stone. Interesting thoughts, Ben (Speckman?). But you probably ought to correct the RLDS name: Reorganized Church of Jesus Christ of Latter Day Saints (no hyphen, capital D). Terry H., Steve Walker’s coauthor was Richard Van Wagoner, who is best known for his book on polygamy and his biography of Sidney Rigdon. Their article, “Joseph Smith: ‘The Gift of Seeing,'” was in volume 15, no. 2, Summer 1982, pp. 48-68. Regarding the famed “vault,” I’ve been told by someone who has actually seen it that it’s really just a closet. Darn, that just doesn’t sound so mysterious. JFS may have buried the stone (historically speaking) when it came to the Book of Mormon translation, but ironically he was the most authoritative/accessible source (Doctrines of Salvation) for the fact that the Church still had possession of a seer stone. I always knew about the Seer stone and the Urim and Thummin, but probably due to art work, whenever I would mentally envision Joseph Smith translating the plates I would never envision using either of them. I asked my wife last night if she’d heard of the Seer stone and she replied that it sounded familiar, but she forgot the context as to why it’s familiar. TA. Thanks also. That was an unusual combination. If I recall, Van Wagoner passed away some time ago. I usually can get my citations better than that, but I believe it was 1983 when I read the article. (Perhaps they were a tad late . . . I seem to remember some of that going on at times back in the day). Well worth reading the PDF linked to, the Gift and Power of art. Fascinating. Thanks for the ideas and resources Ben. JI had a good thread on What did you read on your mission? Cheers, Ben. I had a very similar experience while in France on my mission. It’s funny how that works. “Truman Madsen’s Jesus the Christ”. Yeah, my mileage does vary. The church seems to be very concerned with accuracy in art, sometimes too much so (I.e. Carl Bloch’s resurrection painting with angels’ wings photoshopped). So is the argument then that nobody with any clout at any time since JFS decided to correct the art? It seems like the very latest you could argue there was a lack of understanding about the seerstone in the church hierarchy is the publication of Rough Stone Rolling. So why the delay in opening up the dialogue about the seerstone? We all want to know what’s in that vault. Not true. Some of us are firm enough in our faith to trust the leaders of the Church to exercise discretion and restraint in matters entrusted to them, and to do the right thing at the right time. Yes, as the original posting concluded, the future is bright! Oh no, Ben! From what I heard yesterday you’re on the high (low?) road to apostasy as a gnostic. May we come with you? Great post, Ben! Not ten minutes ago I was speaking with one of our multi-language translation supervisors in Europe about how much of an issue we’ve caused for ourselves by not even providing those materials you referenced above in the vast majority of the languages spoken by members of the Church throughout the world. As non-English speaking members become aware of these things, whether through recently translated gospel topic essays or comments or discussions composed or translated into other languages on the internet by informed members or non-members around the world, they’re going to respond the same way those skeptical RMs did in your BoM class, but they’re really not going to be responsible for their naivety. If we want our membership to have a solid foundation, we need to make sure this information is available and promoted to members whereever they are and whatever language they speak.